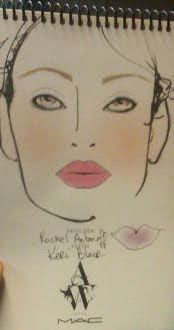 Not many things make me want to go back to high school ... but M.A.C Senior Makeup Artist Keri Blair's look for the Rachel Antonoff Fall 2011 collection just might! The concept centered around the dance from The Virgin Suicides (coincidentally one of my favorite books and movies), with what Keri described as "pretty young-looking makeup." "When I think about makeup in high school, it's all about black liner inside the eye," Keri told me backstage as she worked on the face chart. She began with a filled in, boxier eyebrow, saying, "Eyebrows are a major time capsule. The fuller they are, the more unkempt, the younger the feeling of the makeup." She accomplished this by using a paler shadow like M.A.C Omega or M.A.C Coquette, brushing it through with an angled brush "to give a little more depth to the eyebrow." Once the models were in place for the presentation, Keri brushed the brows up a bit. Keri used Smolder Eye Kohl on the waterline and curled lashes (but used no mascara!). She used a Creme Blend Blush on the cheeks and Strobe Cream on the high planes of the cheekbone "to add a little youthful glow," she said. Seriously, how adorable was this model? Models fell into two camps when it came time for lips. Most of the girls, like the one seen in the pictures here, were given a fresh, girly look with a blend of M.A.C Sheen Supreme Lipsticks in Full Stop and Impressive, mixed together and patted onto the lips with soft edges. But five "bad girls," as Keri described them, were seen with a stained mouth thanks to Currant and Red Lip Pencils. "They look like they've been making out with their boyfriend behind the bleachers -- they're the badasses of the school," Keri said.